Post-Holiday Tips. Making Easter 2019 a cinch. I have a Holiday Closet at home. In it, you can find anything from plastic Halloween spiders to heart shaped melamine plates for Valentine’s Day. I’m often teased for holding onto this stuff, but hey, when Fourth of July rolls around and people need Uncle Sam hats, they know exactly where to go. In reality, storing all these holiday supplies saves me money. I’m not the one out there buying those oversized New Year’s Eve glasses and noise makers year after year after year. It also saves me a ton of time and I get to avoid the crowded stores during the busy holiday seasons. Get started on your own holiday closet and check out our suggestions for making next year’s Easter a snap! Once they have been ransacked for candy, save all those plastic eggs. You can use them again for next year’s egg hunt or Easter basket, and they actually come in handy for at-home playtime (see Egg Hunt article) or snack holders. Don’t toss those Easter baskets! Keep the nice, big ones for next year—but don’t forget to save the smaller (uglier) ones that kids receive from friends or relatives. They come in handy for those town sponsored Easter egg hunts or to use as random Easter décor around the house. Save those cute stuffed animals that the kids received from random great aunts and/or cousins and put them in their Easter baskets each year. They fill up the basket for the younger ones and it becomes a funny running-joke for the older ones to see it reappear every year—just like the orange in the bottom of everyone’s Christmas stocking. Hilarious. That fake Easter grass is made from plastic…and I’m *pretty* sure it’s not allowed in the recycle bin. So instead of sending it off to the landfill, save it for next year’s basket by storing it in a Ziploc bag. Using the paper grass? Awesome! You can still store and save in the same manner for next year. Kids don’t need five packages of bunny bubbles or twenty Easter Egg pencils at once. Split up the quantity and, if they’re still age appropriate for next year, put the other half in next year’s Easter basket. Have friends? Pool your funds and ravage the Oriental Trading catalogue. If your Easter Bunny wraps the baskets in that pretty pastel colored cellophane, tie it at the top with a simple bow. This way, the kids can unwrap the baskets while keeping the cellophane in one piece. Fold it up and save it for next year. Even the Easter Bunny likes to recycle. The day after Easter is the perfect time to raid those dollar bins and discount stores (Dollar Store, Five Below, Walmart, drug stores) for their holiday items. 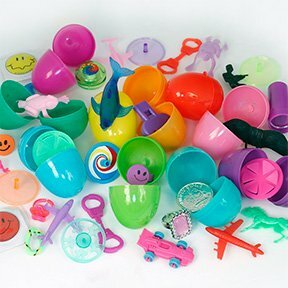 If your kids’ plastic Easter eggs and/or Easter baskets were mutilated at all during the frenzied unveiling, now’s the time to buy replacements for next year. Most times you can pick stuff up for 75% off the regular price! Now all you need to do is clear out some space for your own Holiday Closet! See you next year, Easter Bunny! Previous PostPEEPS S’Mores Easter Treats. Yes, please! Next PostEaster Candy Rationing 101. How to successfully limit without (much) grief.